At 8:00PM EST, Celebrity chef Carla Hall from “Top Chef All-Stars” will be LIVE online and available to take questions. For foodies, kitchen newbie’s or anyone tasked with a holiday meal, Carla will answer their questions, will give cooking tips and an inside peek into the celeb world of “Top Chef.” Whether you’re putting together a feast for the whole family, baking a few cookies for Santa or your loved ones, the busy holiday season lends itself to a lot of time in the kitchen. Chef Carla Hall – who cooks from the heart, and balances her Southern traditions, classic French training, and holistic approach to food as an entertaining expert and owner of Alchemy by Carla Hall in Washington, DC – will talk about seasonal, local ingredients that’ll spice up any holiday dish and answer any cooking questions you may have. One day a few weeks ago, I got a random email from my high school bff Harvey about “French Restaurant Week.” How could I not know about this? I did some research and realized that it wasn’t a real thing, but that France-Atlanta, an organization designated to be the liaison between (duh!) France and Atlanta, was offering a promotion: special prix fixe menus at select French restaurants in Atlanta as a way to introduce us southerners to the cuisine. Harvey and I decided to try Atmosphere Bistro. And I made up my mind that I would finally try escargot! That’s right, the snails!! Atmosphere is located on Piedmont just north of Ansley mall; a small house with simple signage that’s easy to pass. We walked into the teeny restaurant and were seated immediately at a table with a view of piedmont. We asked about the France-Atlanta menu, but the server seemed confused. He brought back a special menu only valid on Wednesday and Thursday that didn’t match what we saw online. Instead of inquiring further, we decided to start with drinks and just order from the regular menu. Champagne! How festive and fun. I knew it was going to be a good meal. So who won! Of course I did. Harvey’s veal liver was perfect, but it was served with mashed potatoes. How original. My Coquille St. Jacques wasn’t just scallops with mushrooms, but scallops with mushroom ravioli! The tender pasta, the white wine sauce, the garnishes… I cleaned my plate! Oh but that wasn’t the end. We also ordered dessert: profiteroles and chocolate lava cake. The profiteroles were more like mini ice cream sandwiches than anything. And as I’m not a big chocolate eater, Harvey had the entire chocolate lava cake to himself. It looked… chocolaty. And he never complained, so I assume it was good. Would I recommend Atmosphere Bistro? Absolutely. I’m not an expert in French cuisine, but I enjoyed it. Will I go back? Hecks yeah! I forgot to order the escargot!!! Again, happy holidays to everyone and very special Happy Hannukah to my dear friend Michael Zouroudis. My Uncle Stan deep fries a turkey for EVERY holiday! I’ve never watched him do it, but I imagine he’s got it down to a science by now. I found this video on Good Morning America… If you are planning to deep fry a turkey this year for the first time… or even second time- PLEASE watch this video first. And then go back and watch my “Fire safety” video. (1) NEVER do this inside your house, in your garage, on your deck, near your kids or pets, or just behind your house… Execute well away from everything you love! (2) NEVER Trust the fill line, always test it yourself with water before you fill and light the pot. See video for example. (3) Place the bird in the fryer properly (cavity down) so that the oil will drain when you pull it out. (4) Kids and cameras are often NOT a good combination, but I have to admit I laughed. WATCH THIS… What To Do If You Set Your Kitchen on Fire! This may be your first time hosting a holiday dinner and you want everything to be perfect. Please remember that 1 in 8 households will have a kitchen fire at some point during the year! So the video below shares some great tips for what NOT to do when you encounter one. (1) Do NOT throw water on a grease fire! (2) Do NOT throw flour on a grease fire! (3) Most clothes are combustive, so choose your cooking clothes carefully. (4) Have a fire extinguisher and a phone handy! (5) Let firefighters do their job! Thankfully, majority of my family is in Atlanta. And a great deal of my extended family is in Georgia. So when the holidays come around I never have to think about where I will spend it or what I will eat and do. We generally meet at someone’s home to enjoy the mother of potluck dinners! Deep fried turkey and dressing (not stuffing! ), collard greens, green beans (sometimes casserole), vegetable medley casserole (a secret family dish), macaroni and cheese and Mexican cornbread—just to name a few. But if you aren’t lucky enough to have a family to share this holiday with—or maybe you can’t be with the family you do have—you do have options. 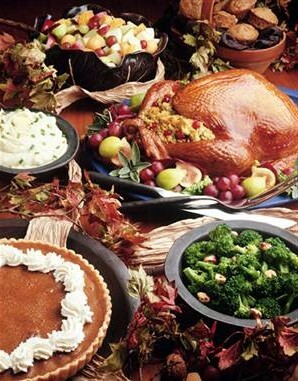 There are several restaurants in the Atlanta area open for Thanksgiving dinner. And even if your family gets together, these prix fixe menus may be just what you need to save sanity, money and time! http://tiny.cc/cfcy7 Check out the link for more details on where to go! Some faves of mine from this list: South City Kitchen, Nakato, McCormick and Schmicks, Fire of Brazil and Craft Atlanta. Remember, thanksgiving should be a happy time. Don’t let the stress of hosting ruin it for you.